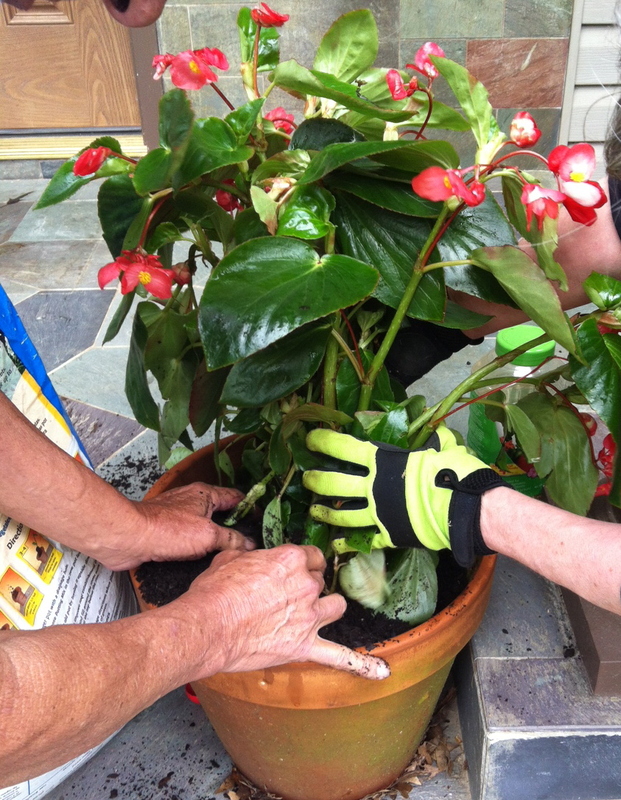 Divide and Repot the Plants in Your Mother’s Day Hanging Baskets for Extra Quality and Quantity – Johntheplantman's stories, musings, and gardening. Can you imagine how many flowering hanging baskets are sold for Mother’s Day presents in the United States? If I had to guess, I would say maybe a mazillion, more or less. Most of the baskets that you see on the market are of excellent quality, too. 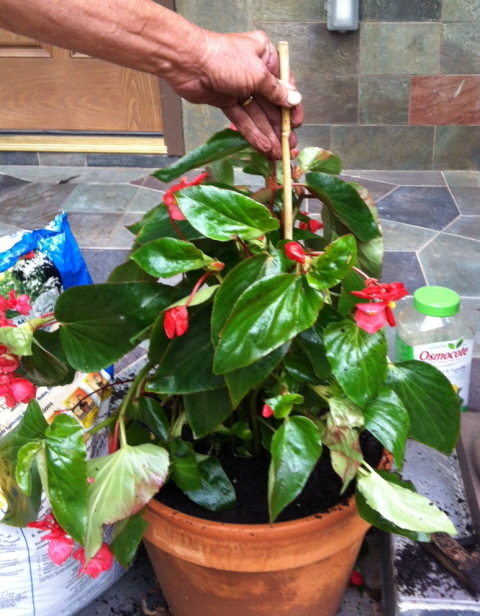 Here is a picture of the dragon wing begonia baskets that I bought for my mother, sister, and sister-in-law. Now, in order to turn out a mazillion good looking baskets on a tight production schedule, the commercial growers will use about four or five mazillion plants. The beautiful baskets that we purchase from the florist or nursery will more than likely have several individual plants in them. I looked under the foliage and counted four begonia plants in each of these baskets. 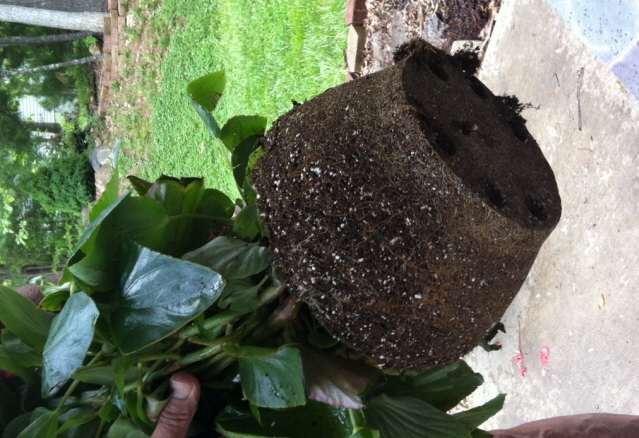 I took the planting out of the basket and found that it was almost root-bound. It is unlikely that this planting would perform well for the entire summer without copious amounts of water. The plants just need more room. I very carefully worked my thumbs and fingers into the root ball to break it in half. 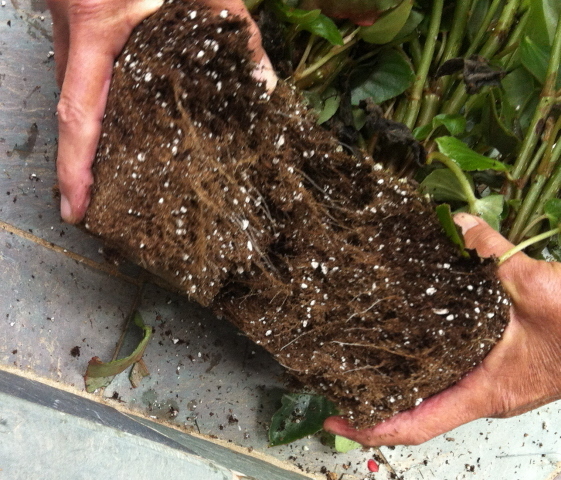 I took each half of the planting and carefully split it further, ending up with four healthy, well-rooted plants. 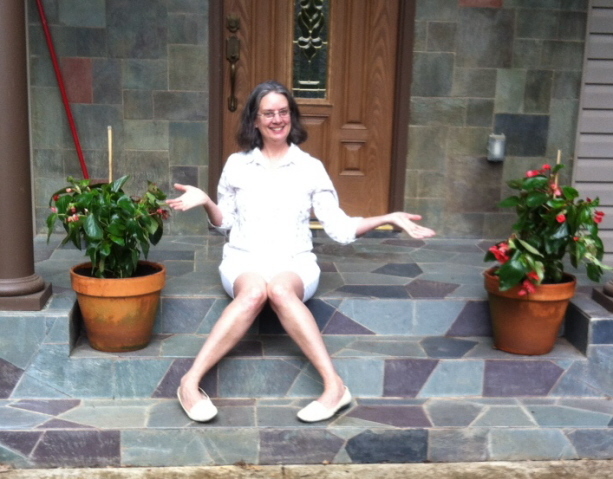 My sister-in-law, Sheila, wanted a nice potted plant on each side of her entry steps so we decided to use two of the plants in each pot. The plants will love the extra room and will grow large and lovely in a short time. I was given two 12-inch clay pots. 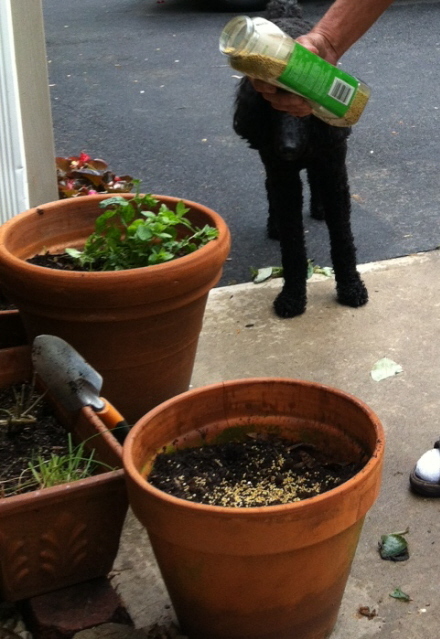 We filled them partially with potting soil and then I sprinkled Osmocote (a time-release fertilizer) over the mixture. 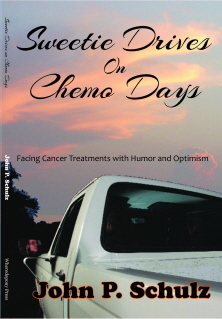 The fertilizer is one of the main secrets to success. 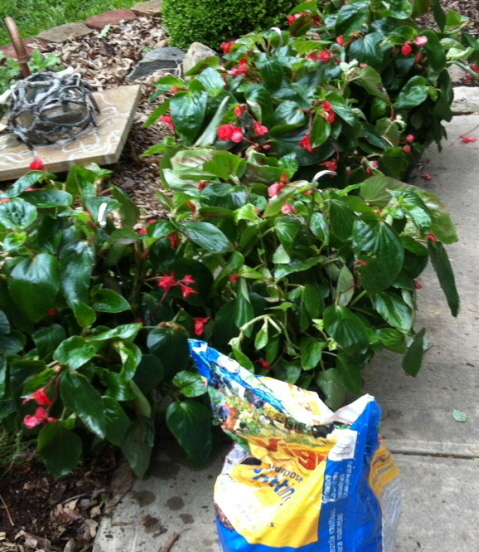 Add a time release fertilizer that will keep the plant well-fed all season. I chose the tallest plant and set it to the rear of the pot. We placed another of the plants to the front, looking for a bit of symmetry, and Sheila held the plants while I packed potting soil around them. With larger plants like these, this is a two-person job. I would ordinarily prune these plants (see my article, “The basics of pruning”) but we decided to stake them instead and let them do their own thing. 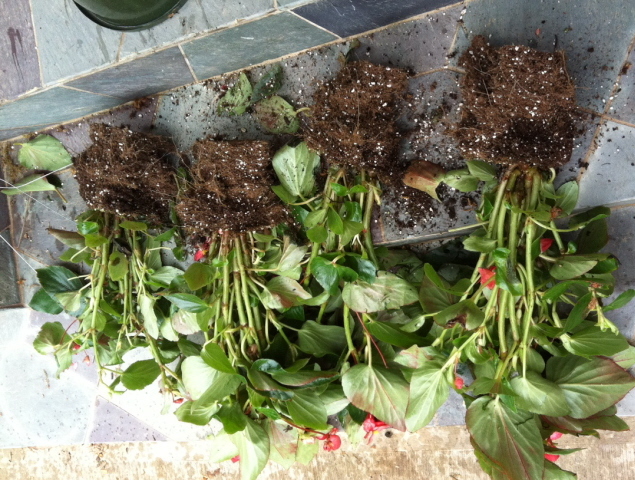 Staking and loosely tying the plant will help it to root in nicely. 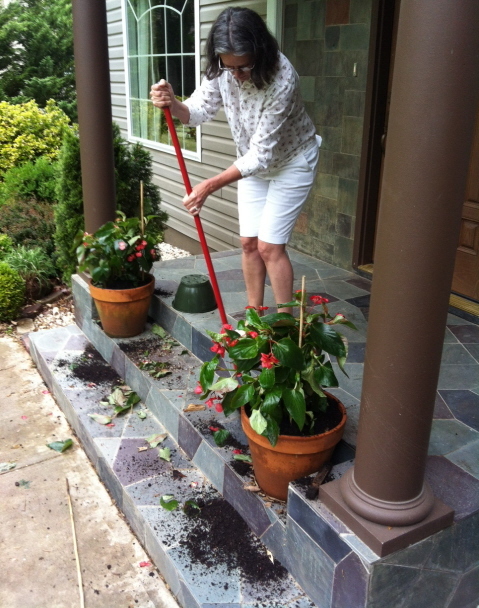 My sweet wife, Dekie, helped me clean up the mess. She is well familiar with my magnificent messes. Every now and then I get help with my messes. Dekie really liked the planters. 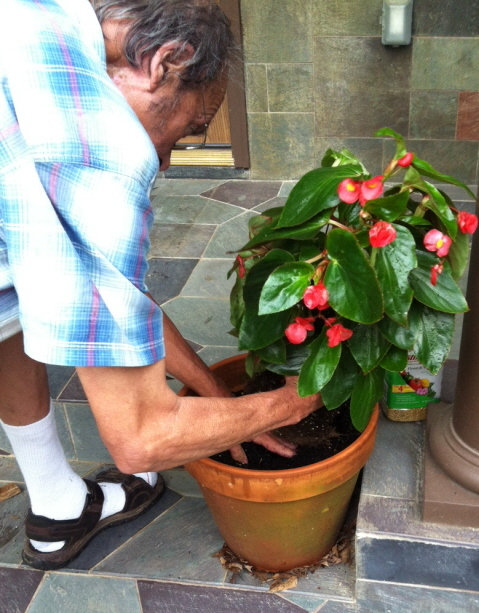 And here’s another article I wrote a while back about planting containers for summer color.